Because there are over 100,000 vendors, a "Treasury" is one way to expose a few of those vendors and their work. My cards have been listed in several treasuries, but until now I have failed to save them (they disappear after a few days.) Below is the most recent one in which a Skeese Greets card was listed. 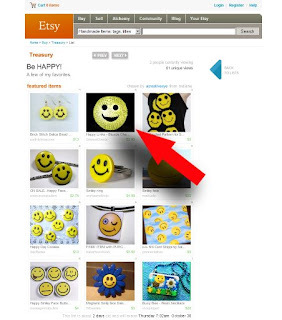 The Treasury is titled, "Be Happy" and consists of Happy Face items from 12 Etsy.com shops. The creator of the Treasury chose the "Happy Links" bicycle chain card. Another way in which Etsy shops can gain exposure is through "The Storque." 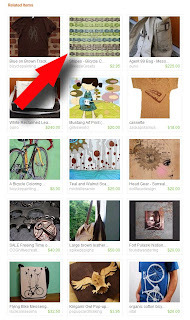 The Skeese Greets Etsy shop had only been open a couple of weeks when one card was featured in a Storque article and displayed on the front page of Etsy. To my surprise, the featured Stripes card received over 700 views in about 30 minutes. Unlike the Treasuries, Storque articles stay archived on the site and you can read the one about Skeese Greets HERE. When there are millions of items from which to choose, it's pretty cool to be hand selected for Treasuries and Storque articles. I'm flattered and very appreciative each time. Congratulations. It's always a surprise when you look at your items views and they're going up like crazy.